Selling an apartment in Bermuda Views, Dubai may have come back into your mind recently on receipt of an email from current developers, Innovation SEZ. Many purchasers thought, after 10 years of silence, that their investments had completely disappeared. This is not, however, the case. While the development is not yet complete (see attached picture from February 2015), there are buyers available to take on the contracts and see them through to completion. This is important to note, because many people who bought in Bermuda Views back in 2005 are no longer in a position to complete or have just lost interest in the Dubai story emerging from the United Arab Emirates at this stage. 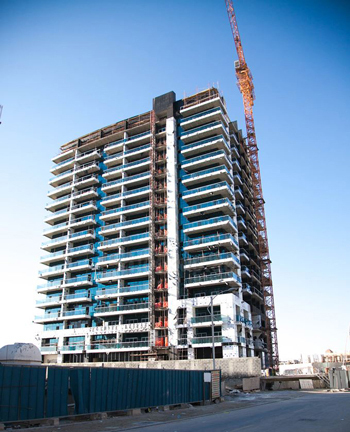 While Innovation SEZ claims the Bermuda Views tower will complete in late 2015, our contacts on the ground in Dubai say that the development is, in reality, 12 months to 2 years from completion. It depends on how much resources SEZ puts into completion and, at the moment, it doesn’t seem to be in much of a hurry to complete. It is more interested in getting money in from wherever it can – which is why clients there have been contacted to pay further installments. If you have been in receipt of one or all of the emails below (scroll to the bottom of the post to see the emails) from Rushika Kheradia, Customer Relationship Manager at Innovation SEZ Developers, currently the master developer of the Profile Residence, Bermuda Views and Eagle Heights projects in Dubai. The email has sprung somewhat of a surprise on many of its recipients, essentially it is looking for those who purchased units back in 2004 to 2006 to pay recently introduced Dubai Property Registration Taxes (due at the end of June 2015). Some people are delighted with the above news, because they thought they were never going to get a property in Bermuda Views. Others, however, are not so happy. This is either because they never intended to take ownership of the properties in the first place (they bought them to ‘flip’ them before taking ownership back in the days when that was the done thing) or they are now in a very different place financially and simply can’t afford to complete or simply have far better uses for that money right now. Either way, some people would prefer if the developer would go away and not contact them again. Well, never fear, that property that now seems like a millstone around your neck may actually be worth something. If you have received communication from Dubai asking you to complete on your property we may well be in a position to help. Just drop a note to info@diarmaidcondon.com and, on receipt of details of your unit, we’ll endeavour to find someone that will either purchase the contract from you or the property if it has already completed (in other developments obviously). We can’t guarantee anything, because these are assessed on a property by property basis, but we may be able to get you some sort of monetary return for your investment after all these years. A kind reminder to do the needful. Please avoid this email in case you have already made the payment for your Unit Registration at the Dubai Land Department. Please find the attached ‘Unit Registration letter’ and ‘Dubai Land Department Circular (in Arabic & English)’, which is self explanatory. Should you have any queries, please do not hesitate to contact us on the below mentioned number.